You always tend to choose products you like and when it doesn’t suit you, you get disappointed and feel wasting huge money on the product. This happens many times, doesn’t it? There are still many people who don’t know how to choose a product. They still wash their face with that regular soap and dab some easily available cream and finish it with some powder. But many still don’t provide their skin what it needs. To know what your skin needs exactly, it’s important to know what type of skin is yours, isn’t it? Now I hope you know that there are different types of skin, don’t you? We know that there are 3 major types of skin. What are they? What Are They? How Will You define each of them? We’ll discuss but let’s first divide the skin types into 5 types to make it little precise and then let me tell what is each of them. Your skin feels dry and dehydrated. It looks flaky and lifeless and no trace of oil on it. It feels like you need to apply moisturizer to keep it normal. Your skin looks moist and oily. You may feel very greasy and have pimples and acne. Your skin pores are large and may have white heads and clogged pores. Most of the women have this skin type. You may have oily and shiny T-zone and dry other skin areas. Combination skin type means having more than one type of skin on face. If you don’t know what T-Zone is, then let me tell you that it covers the forehead, your nose bridge and your chin. Caring for this type of skin is difficult. You may have dry skin and have irritated and inflamed skin. You may develop reddish skin and flaky skin areas sometimes and when you get pimples or acne, treating it becomes toughest part which later may lead to black spots. Products don’t suit you so easily and you tend to breakout with most of them. If you have normal skin then you are very lucky. Your skin looks well hydrated, soft, supple, no trace of oil, no dry patches, looks vibrant, clean and glowing. So by now you clearly know the 5 skin types and you might have already found which one among these is yours, didn’t you? Congratulations for that but wait. It’s not over yet. I want you to get deep into it. I’m further divide the skin types here because even though two people have same type of skin, they may still have certain variations. A dry skinned person may have excessively dry and flaky skin while another lady with same skin type may not have severe issues. She may have just slight dry patches. So, roll down to get deep into it. So, what are the skin types you are going to tell me now? These are 9 types now. Your skin looks dry and tired; it feels so tight round the year and needs hydration. You may have enlarged pores in the T-zone area and have blackheads. You also may have hyper-pigmentation. Your skin also feels dry and tight round the year and needs hydration. You may have enlarged pores mostly in the T-zone area and have blackheads. You may have hyper-pigmentation and you may have exposed to sun rays excessively earlier. In addition you have visible broken capillaries due to skin damage from sun rays. You might have lost skin elasticity as well and are more prone to skin ageing. Your skin has redness or rosacea consistently, and feels tight and dry all the time. It needs proper nourishment and hydration. You too may have enlarged pores in T-zone area and your skin easily gets red and irritated with harsh chemicals. You also may have hyper-pigmentation and most of the products don’t suit you due to skin sensitivity. This skin type is extremely oily and looks greasy all the time. Enlarged skin pores are visible and pimples, acne, blackheads, whiteheads and cysts are seen most of the time. Even if they are treated, red or dark scars are left behind. Heavy oils and pore clogging ingredients break you out. Your skin may not be too oily but your T-zone still shines a lot. You too have enlarged skin pores and harsh ingredients may clog the pores. You too get blemish marks and scars but the only difference is you get pimples and acne occasionally but not too frequently. 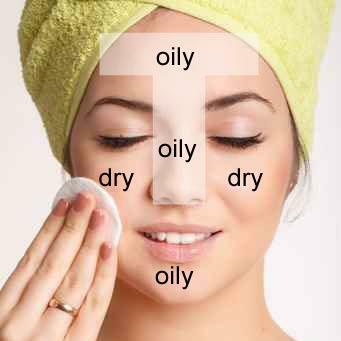 Your T-zone is always moist with oil and you have enlarged skin pores. Heavy oils and pore clogging ingredients break you out. Harsh chemically laden products make your skin red and irritated. New blemishes and cysts are observed so often. Most of the products are just not meant for you. They give you clogged pores and blackheads or whiteheads. Even after treating, scars are left behind. Your T-zone is also moist all the time and your skin pores are large and visible. Heavy oils and pore clogging ingredients break you out easily. Most of the products don’t suit you and make your skin red and irritated. However cysts and blemishes can be seen occasionally which differs you from the previous skin type people. But like them you too face blackheads, whiteheads and clogged pores. And your pimples and acne leave their marks behind. You are lucky to have normal skin but; yes, there is a ‘but’. You have skin redness or rosacea consistently. In the summer your T-zone looks oily and your skin feels tight in the winters. You may have enlarged pores and blackheads in the T-zone. Your skin gets irritated and become red easily with harsh chemicals. You may face hyper-pigmentation. You too need to avoid pore clogging ingredients and heavy oils. Your skin slightly produces oil in the T-zone and feels tight in the winter. You too need to avoid heavy oils and pore clogging ingredients. You have blackheads and enlarged pores around T-zone area. You may have hyper-pigmentation and may look tired. However your skin isn’t sensitive to many products like those above mentioned skin type. You are luckiest of all the skin types. So, these were different types of skin in detail. I hope by now you’ve found out which of these is your skin type. I’ve tried to make it brief and precise so that you can easily find out products based on this. Were you able to find out which of these 9 skin types is yours?